We added another greenhouse in 2015. Water's Edge now maintains 4 commercial greenhouses and numerous outdoor ponds packed with water gardening plants including a heated greenhouse to maintain a year-round environment for our tropical products. Water's Edge boasts the greatest selection and premium retail and wholesale aquatic plants grown and propagated in Colorado's high altitude environment. 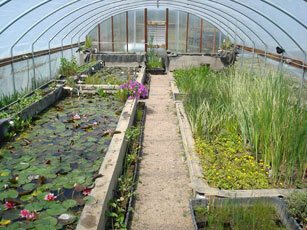 Our nurseries and outdoor ponds contain over 100 varieties of hardy and tropical aquatic plants. 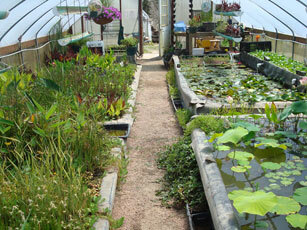 Come see the wide variety of wonderful plants ready for your water garden. 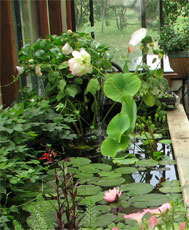 The owner, Suzy, is often found with customers reviewing the plants that are best suited for their environment and easily persuaded to tour the Water's Edge private gardens for other water gardening ideas.